At flipkart.com you can purchase Canon EOS 750D Body with Single Lens: 18-55mm (16 GB SD Card + Camera Bag) DSLR Camera(Black) for only Rs. 39,999, which is 26% less than the cost in Amazon.in (Rs. 53,990). The lowest price of Canon EOS 750D 24.2MP Digital SLR Camera (Black) + 18-55 is STM Lens + Memory Card + Carry Bag was obtained on April 18, 2019 6:38 pm. Excellent product. Meets all your expectations. I am merely a person interested in photography and videography – both – with little to no knowledge about either one. 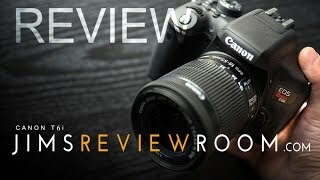 So, with that disclaimer, if you’d like to know the opinions of a tech enthusiast who did his research and is taking his first strides in the direction of photography and videography, continue to read.Possible alternatives:You might look around and find a myriad of options to choose from. There are Nikon, Sony, Panasonic and Canon options too.To put it briefly, Canon has superior video quality than Nikon; Sony has controls that I find difficult to get used to and also that they don’t have decent cameras in the range I am looking for; the availability of Panasonic cameras in India is bleak; and coming to the Canon alternatives, the 1300D lacks an articulating screen and 70D is over my budget of 50K. This is a quick overview of all the possible alternatives.With that out of the way, let’s see what the camera has to offer.Sensor and Image Processing:It’s a 24.2MP CMOS image censor. This provides for a really good image size if you need to crop the picture later on. Since it has 24.2MP, you can easily crop the image to a still stellar quality image if the need be. Apart from that the megapixel count does not really translate to better quality as is the case with all cameras.It has a DIGIC 6 image processor which is a very capable processor and one of the newest Canon has to offer. The DIGIC 7 was only recently announced and the difference should be not that substantial. The whole technical specifications can be found on Canon’s website, hence I’ll leave that for you to check if you are interested.Photography/Videography Experience:The photographs can be saved as JPEG, RAW or even both JPEG and RAW simultaneously if you want to have both copies for whatever reason. It includes only one SD/SDHC/SDXC Memory Card Slot which is sufficient for enthusiasts, but professionals may require the extra slot for backup. Also, the battery and memory card have different flaps to cover them so you don’t have to open the battery flap to change the memory card and vice versa. Also, since the memory card slot is on the right of the camera, it makes it easy to be replaced if necessary while mounted on a tripod without having to unscrew it from the tripod.The images are generally good when clicking pictures using the manual mode which provides for an array of options. The ISO options are from 100-12800. The shutter speed is upto 1/4000 sec. And the stock lens performs well for most situations, but you can always get another EF lens later down the line if need be.Taking videos is a pleasure with the camera. The auto-focus is quite snappy and focuses in on the subject pretty fast. The 19 cross-eyed AF focus points provide for a quick auto-focus both in photos and videos. Though it is not as good as the ones on Sony which have insane number of AF points, this is no slouch. The freedom to change the camera settings like the ISO, aperture, or the white balance during video recording is a refreshing improvement for anyone coming from a handycam which has only fixed settings on video mode.The manual mode is what any beginner should be using to learn how to use the camera better and want to improve their photography/videography skill. It gives absolute freedom and the only limit is one’s creativity.Features:The WiFi capability is no gimmick. It is futuristic to say the least. It will save you the cost of buying a remote shutter later on. The shutter can be triggered using your smartphone with the right applications, and you can also use it to shoot time-lapses. Moreover, you can quickly transfer photos if you need to upload them to social media without reaching for your laptop/desktop.The NFC is also a nice addition since it will help your device to pair to your phone even more conveniently if your phone has NFC as well, but if it doesn’t, it doesn’t hurt to have NFC. It’s future-proof in that aspect.The touchscreen is incredibly helpful. You get used to it and then you start pressing on LCDs that don’t have touchscreen. It makes navigating through menus a breeze and focusing using the touch is a welcome addition. The touchscreen should not be overlooked as a feature that is unimportant. The touch response is nearly as good as any modern day smartphone. You’ll enjoy using it, trust me.Battery life:The battery life has been great. Just turn remember to turn off the WiFi when not in use. I have been able to easily record a couple of hours of Full HD videos and click a number of pictures before the battery died. The battery life is satisfactory for my use, although I can see other reviewers complaining about it, I’d humbly differ. Nonetheless, buy an extra battery for extended or heavy use, it’ll come in handy.Build Quality/Form Factor:The form factor of the DSLR isn’t too bulky, in my opinion. It is not small by no means, but it’s not a DSLR you’ll struggle carrying around in your hand. It is one of the smaller sized DSLR cameras, not the tiniest though.The positioning of the buttons and the feel of the buttons are also convenient and easy to use once you get the muscle memory to remember which button is which. One rarely will struggle to reach the buttons.The build quality is decent. I don’t think it is the best built camera, but the build will last with careful use. It may even survive a few drops, but I am not at the liberty to test the durability like that. It does feel sturdy and well built. Keep in mind that there is no water-proofing/resistance, so you might wanna keep it dry and away from the pool.Verdict:Well, my observations are the observations of a starter, and likewise, I hope that some starters benefited from my experience. If you are a starter/beginner or just a hobbyist photographer/videogrpaher, go for it. But if you are only interested in photography, check Nikon too, they provide marginally better image quailty. 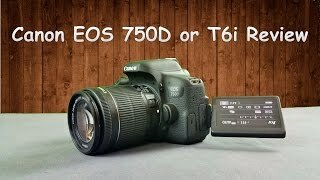 As an all purpose (meaning videography and photography) camera, the 750D is king at the sub 50K category.The competition may increase with the new releases of cameras which are yet to be tested and used, but if you want one that’s been tried and tested, the 750D is a good one. It will not be rendered obsolete by the new releases since it is feature packed and has some great specifications that’ll last you a while. Nice Product with amazing delivery done by Amazon.